For anyone looking at being a wildlife cameraman as a career here is another opinion that might be useful. Wherever you are in the world there will be ‘wildlife things’ going on. If you are really interested in wildlife you will be on almost constant alert to what is happening around you. This can, I warn, be very boring for friends who are not of the same inclination. They may even think that you are talking absolute rubbish. The other day I heard the house martins above start alarm calling, which is usually the sign that some sort of avian predator is about. We were near some fishing ponds, and lo and behold a hobby shot across. I mentioned this to the person I was with, then showed them what the bird was in an identification guide. They said that they had seen one before but hadn’t realised what it was. It’s a great way of extending your wildlife knowledge. Very near to home I have been keeping an eye on the roses this year. They’re very nice, chosen more for their scent than anything else. Over the last couple of years leaf cutting bees have been taking chunks out of the leaves and stuffing them in holes in fences posts. Sometimes I see them fly with these leaves miles away across the roof tops. Just seeing this prompts you to check out the species, what it is doing, its breeding status and so on. Hence this becomes a very personal learning experience, sparked by something that you have observed yourself. Bees aren’t the only creatures that love our roses. We don’t like using poisons in our garden. The roses probably suffer a bit as a result. 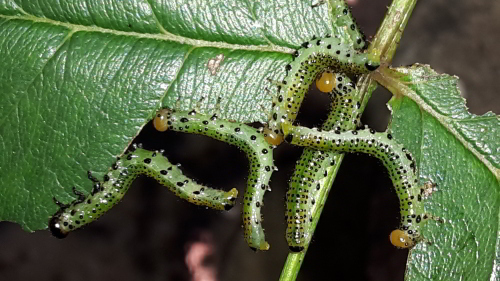 The caterpillars above practically demolished a small part of this rose bush (rose sawfly caterpillar). There was a small pile of dead leaves underneath it, but the plant as a whole bloomed well. 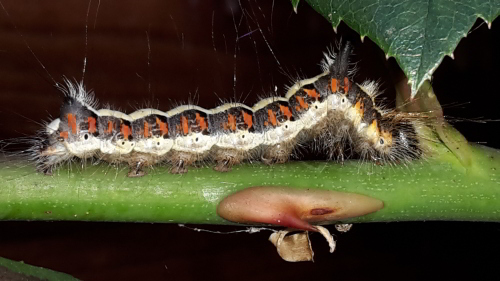 The hairy beast above is the caterpillar of a grey dagger moth. I have never moth trapped our garden, but seeing this makes me think I should, just to see what is likely to be fluttering around at night. How could you spray chemicals on a creature like that? Maybe this is a wildlife cameraperson trait, or maybe just of someone with an ounce of compassion for other life. Anyway, having got lost in all that, the moral is about observation and following up on that observation. A bank of field knowledge will serve you well in your wildlife cameraman career.